Portraits: British 18th C 44 comments Is the sitter in this portrait the lawyer William Watson (1782–1864)? William was the eldest son of William Watson (NT 1230271.1) and Dorothy Yelloly Watson (NT 1230271.2). He studied as a lawyer. I have a copy of a family photograph which belonged to my 3ggrandfather, noted as Uncle William Watson; the eldest son of William and Dorothy was my ancestor’s Uncle William. Could the man in this portrait be the same man as in the attached photograph? The portraits of William’s parents are labelled on the back noting they are the parents of William. The labels seem to have been written by his son, Joseph Yelloly Watson (1818–1888). William had three male siblings who lived to adulthood: Chatto Watson (1788–1814), a wine merchant; John Watson (1791–1858), a Lieutenant in the army; and Joseph Yelloly Watson (1793–1818) a Cadet in the East India Company (EIC). My research indicates that the uniform of the EIC was often mistaken for that of the Navy until about 1820 when it was changed. The portrait I have queried seems to be in a set of five, four of which appear to depict the occupation of the sitters, which coincidentally are also the occupations of the four Watson brothers. These brothers were first cousins of Sir W. H. Watson who married Anne Armstrong. I have a copy of a diary from 1804/5 which mentions the relationship between these cousins, who appear to have lived in close proximity in Bamburgh during Sir W. H. Watson’s very young childhood and were often with each other. Watson family portraits are mentioned in the Will of J. Y. Watson of 1888. If they are Watsons, they would have hung at Adderston Hall when this family lived there between 1808 and 1818. I do have this photograph of William Watson (although a much older man) and would like opinions as to whether he could be the sitter in the portrait. The pamphlet is a copy of the ‘Bill of Rights’, 1689. 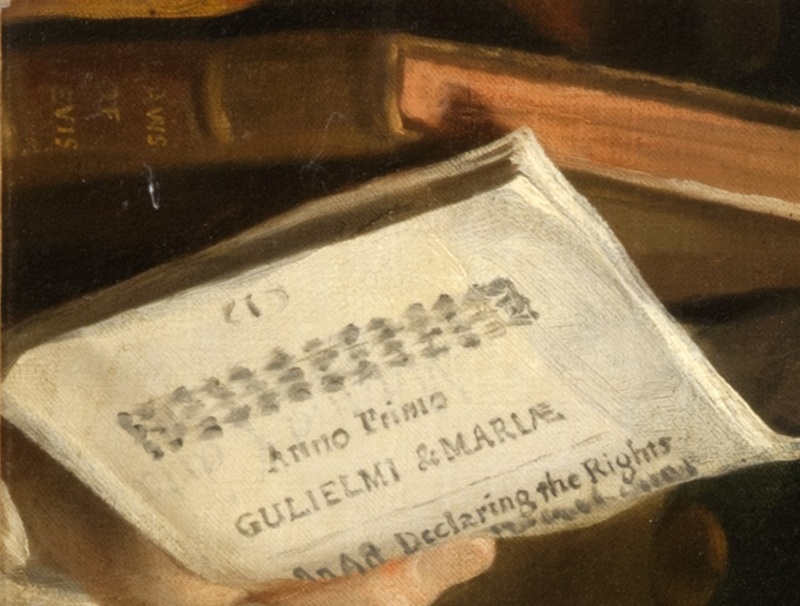 The full description of the pamphlet that the sitter is holding is Declaration of Rights in Anno Regni Gulielmi et Mariæ Regis & Reginæ Angliæ, Scotia, Franciæ & Hiberniæ, Primo. London: Charles Bill and Thomas Newcomb, 1689. 'The Laws of Nevis' relate to the British West Indies colonies, of which the island of Nevis was one. The book depicted could be a copy of the "Laws of Nevis (Acts of Assembly, passed in the island of Nevis) 1664–1739 (1740)". Can anyone tell from the sitter's jacket the era from which he came? It is worth bearing in mind that the US politician and statesman Alexander Hamilton (1755 - 1804) was born in Charlestown, on the island of Nevis, and was active in ending the legality of the international slave trade. Perhaps there is a connection to the sitter through his influence. Looking at the style of the coat - the double row of metal buttons, sliding button holes and a full neck collar, this would be around 1805 if he was up to date on fashion. If the coat is full length front and back with no tail, it would be classified as colonial style which maintained it's fashion status until around 1820. It's a shame we can't see the cuffs or length of the coat. The Watsons business included trade with the West Indies. They had their own ship “William and Clement” ( or maybe “Clement and William” ) which sank off the Bamburgh coast in the 1790s. An Uncle of Dorothy Yelloly Watson was Joseph Yelloly who captained the “Friendship” to and from the West Indies. Might this have a connection to the pamphlets the sitter is reading? If the sitter was up to date with the fashions the timeframe would be correct as William would have been 23 years in 1805. Can you comment on another portrait which might be related? I think this is Williams brother Clement Chatto Watson 1788-1814- a Wine Merchant. Comment on the fashion in the portrait I have noted above I mean, thankyou Angela. Thank you Patty for noting the previous discussion regarding this portrait amongst a group of five in the same frames. The Watson family seems to have been dismissed in the discussion you have noted, concentrating on distant relatives of the Adye and Payne families instead. I was unable to comment on that discussion as it had been closed when I came across it. I first became aware of the Cragside portraits in 2008. At that time some descriptions and timeframes differed to what is attributed to them now. I would like to comment on each portrait separately, hopefully providing information and sources which show the likelihood that these are Watson family portraits formally in the possession of William and Dorothy Yelloly Watson and depicting their four sons who were first cousins to Lord Armstrongs' brother in law William Henry Watson. It is worth noting the portraits of Wm and Dorothy have been identified by a label on the reverse ( signed by Joseph Yelloly Watson) and are in the Cragside Collection. This would not have been the case until after 1888 when 'Watson family pictures' are mentioned in the Will of the couples Grandson and family representative Joseph Yelloly Watson 1818-1888. This portrait is now titled C E Adye. When I first happened upon it it was 'An unknown Gentleman, possibly C E Adye.' Despite numerous enquires a man named C E Adye cannot be found or placed. I think this is Adam Yelloly 1741-1810, brother of Dorothy Yelloly Watson. He lived in close proximity to his sisters Watson family, a Gentleman Batchelor he left a considerable fortune to his two surviving sisters, £10000 each and had no other nieces or nephews apart from the Watsons. Adams age fits with the timeframe attributed to this portrait 1770-1799. Can Angela comment on the fashion of this gentleman please? This portrait now has the date 1770-1799 but when I first saw it the date was 1800-1820. According to Angelas comment above it is possible it could be c1805. 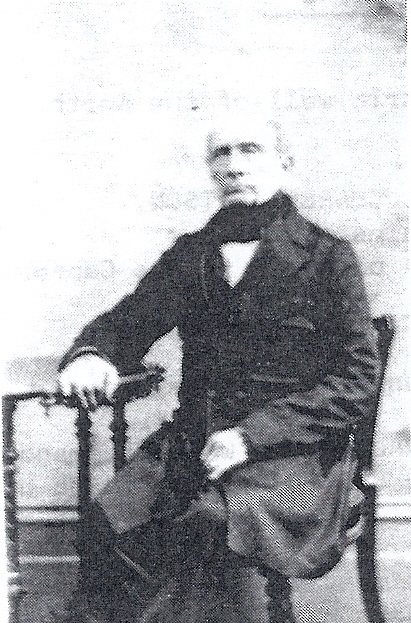 William Watson 1782-1864 was the eldest son of Wm and Dorothy, first cousin to Wm Henry Watson 1797-1860. He studied Law, married a Heiress with considerable property in Essex and did not practice Law. His descendants are known to have kept in close contact with the Watson-Armstrongs into the 20th Century. I have been told there is a photograph of this Williams Greatgranddaughter Mabel Yelloly Watson 1882- 1970 in the Cragside collection. Please consider the family photograph I have supplied of this man, although much older and poor quality ( the original photograph was very small and not in my possession). This portrait has the date 1700-1799 attributed to it however when I first saw this portrait the date was 1800-1820. This could be the second son Clement Chatto Watson 1788-1814 who was a Wine Merchant in London. Can you comment on his fashion please? Again the date was previously 1800-1820, now stating 1770-1799. It appears that this young man is a Lieutenant with one epaulette? John Watson 1791-1858 was the third son, a Lieutenant in the Army I have not been able to identify his regiment. He married and settled in Ireland in 1815, the marriage record calling him an Officer, his sons marriage record in Australia also referring to him as Officer. He is listed as a subscriber (Lieut. John Watson, Ireland) to the book by Wm Henry Watson in 1825 "A treatise on the law of arbitration & awards.." along with his surviving eldest brother William Watson, Essex. This portrait now titled "An Unknown Young Royal Naval Lieutenant, possibly William Henry, Duke of Clarence, later William IV (1765 - 1837)" the identification is discussed in the thread noted above by Patty. The previous date attributed to it was 1800-1820 it now states 1785-1786. Joseph Yelloly Watson 1793-1818 became a Cadet in the East India Company in 1812. He trained at the East India Company Military Seminary at Addiscombe before travelling to India where he died from Yellow Fever in 1818. There is no mention of the EIC in the previous thread, can anyone comment on this possibilty? My own research indicates that the uniform of the EIC was very similar to that of the Royal Navy until c1820. I am sorry this comment is so lengthy. I will add another comment including resources and information I have found in relation to the Watson family. Good evening Alison, No apology needed! We're extremely grateful to you and others for taking the trouble to add your substantial research, and look forward to your further information and ideas on the Watson family portraits. Alison, re the RN Lieutenant portrait that was the subject of the previous discussion (and the age & identity of which clearly affects your hypothesis): you seem to be suggesting that Pieter van der Merwe was mistaken to say in his intro that the sitter's uniform is that of a Royal Navy lieutenant between 1767 & 1787, "down to the detail of the Tudor Rose pattern buttons". See https://bit.ly/2CYwpTq . In your alternative scenario you would like this to be an East India Co one of post-1812 instead – a pretty dramatic reassessment, if I may say so, and it might be wise to google Pieter's name before proceeding along this line. I doubt there is anyone in the country who knows more about British Naval uniforms than he does, and if the EIC was not mentioned in the other thread it was doubtless because it wasn’t relevant. My own feeling is still that this group of portraits at Cragside is of an earlier generation to the one you believe. The wig shapes with tight side curls of all these sitters shout 1770s-80s (or earlier) at me, even without much naval or military uniform knowledge. I really think the date suggested by Angela is much too late – very few young men wore wigs by 1805, and even most older gentlemen had ceased to powder their hair by then (though some still wore it ‘en queue’). The British Army, specifically, discontinued hair powder in 1796, and the queue went in 1800. Furthermore I have a feeling that the small collar turned down over the stock worn by three of the sitters (including ours) is a style that was long gone by the turn of the century. 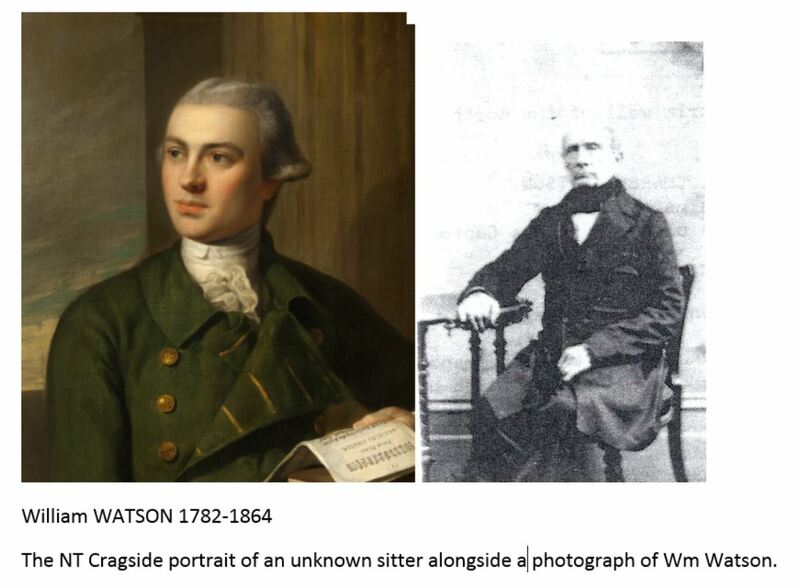 In relation to my initial query as to the possibility of the man in my photograph being the same man as the unknown sitter in the portrait I have attached a visual of the two images together for comparison. There is also the entry from the NT publication of 2008 ‘Cragside List of Pictures and Sculpture’ which states the five portraits were considered a group because of the same frames, possibly Adyes, Paynes or Watsons. There is an image of the five portraits placed together showing the frames. I have attached a copy of a Watson family tree c1860 which I obtained from the Armstrong Papers at Tyne and Wear Archives and Museum, Newcastle. The document is interesting as it does not include all family members but does name the four brothers who may be sitters of the portraits. One brother is incorrectly named as Adam (d India), his name was Joseph Yelloly Watson. Adam was the name of Dorothy Yelloly’s brother though who might be the oldest sitter in the group. 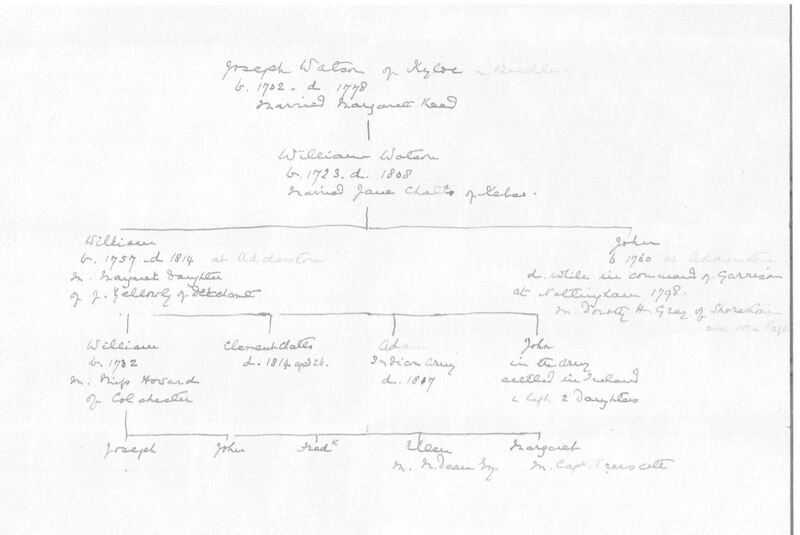 The family tree notes some children of the eldest son Wm, notably his eldest surviving son Joseph Yelloly 1818-1888. In the Will of JY Watson in 1888 family pictures are bequeathed to his eldest son, also JY Watson 1851-1918 who is the father of Mabel Y Watson 1882-1970. There is a photograph of Mabel in the Cragside Collection. Family members of the Watson cousins are also noted as guests at the wedding of Susan Dorothea Fitzpatrick Watson 1873-1961 ( sister of Baron Armstrong of Bamburgh and Cragside) in 1903, indicating the relationship between the two Watson families continued into the 20th century. In 1903 the youngest JYW, a Stockbroker, became bankrupt. Could this event have been a catalyst for the family pictures to have been re-homed at Cragside? It is known that many of Cragsides original artworks were sold c1909 so there was reason and sufficient space to acquire other artworks around that time, particularly if they were free. It should be remembered that the portraits of the parents of the four brothers are certainly in the Cragside collection today. I have a copy of Eleanor Weatherleys Diary 1804/05 where the Watsons are mentioned almost daily. It states John Watson was in a Volunteer Militia in the Bamburgh region at that time. Would that be correct at age 14? He is noted as an Officer at his marriage in Ireland in 1815, the only reference I have of him as a Lieutenant is from the subscribers list in WH Watsons book of 1825. I had identified him as the sitter in the red coat because the Armstrong family tree noted he was “in the Army” which I associated with the redcoat. Reference to the Tudor buttons has really thrown me though and I look forward to some discussion of all the portraits in relation to this branch of the Watson family. 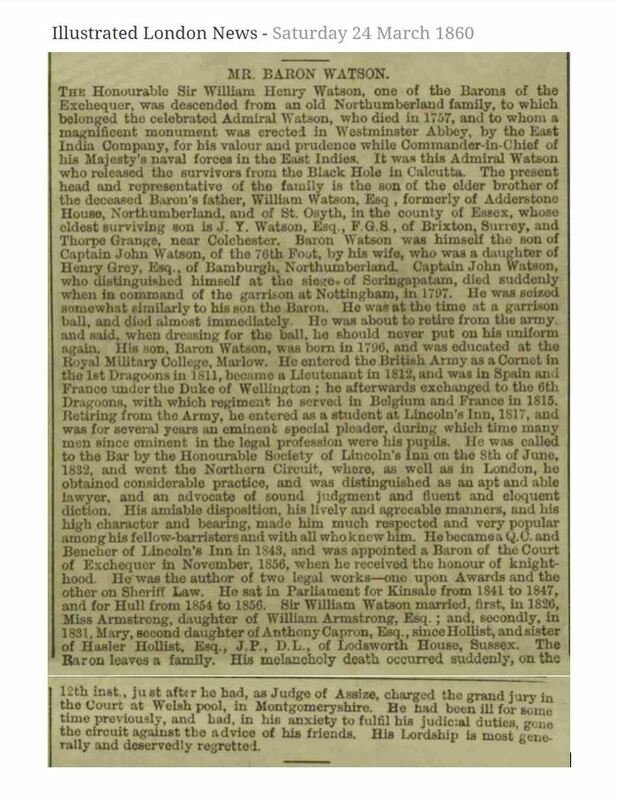 I have also attached an obituary from the London Illustrated News March 1860 for WH Watson, Lord Armstrongs brotherinlaw. Osmund Bullock, I have just read your comment and do feel it a bit condescending. I am not suggesting anyone else is wrong as I am no authority myself. I did state that Watsons seem to have been dismissed and would like them considered. I am a descendant of this family though and have attempted to research them thoroughly from a great distance, no easy task. Yes I would dearly love my hypothesis to be correct. I did in fact help the NT correctly identify and name the portraits of William and Dorothy Yelloly Watson by providing them with my research and correctly transcribing the handwritten label on the back of Williams portrait. I do hope Pieter van der Merwe contributes to this discussion as well because I would like to learn all I can. I will take the time to consider your comments and do some research, thankyou. Did you compare my family photograph to the portrait above? All I can add here is that I think I have identified the 'nautical' uniform of the young man who I thought might just be Prince William correctly - though would not claim the sort of expertise credited to me on naval dress: I simply have ready access to good sources that compensate for an ever-reliable 'forgettery' on the details. But I'm afraid that does not carry the Watson question forward (and certainly won't if the East India connection was an army one). I am sorry to have annoyed you, Alison Elliott. After many days of research I took some trouble to point out the flaws in your argument (or a lynch-pin of it) in what I thought was a tactful manner, but clearly I pitched it wrong. If you read some of the other discussions on here you will see that soundly-evidenced views are often exchanged quite robustly; but that is not your way, and I apologize. Though there are a number of other points I was going to make, with evidence in support, they all point in the same direction. I have no desire to cause further upset, so I think it's best if I leave it at that. Can anyone identify the artist as the portrait is of a competence sufficient to find who painted this work? Does the Bill of Rights suggest that this was painted in the 1790s? Osmund I had confused the military with the naval services, not even being aware they were seperate. JYW was an Ensign of the Chumparan Light Infantry. I must admit I had not even heard of the HEIC until I found his application many years ago and obviously have not researched them very well. It seems then that he would have worn a red coat as part of his uniform, so in my hypothesis he could be the man in the red coat and not the midshipman. I have read some about wigs now and do understand where the timeframe of a previous generation comes from. I do appreciate your comments and would like to hear more. I found Pieter on utube introducing the Capt Bligh Exhibition. 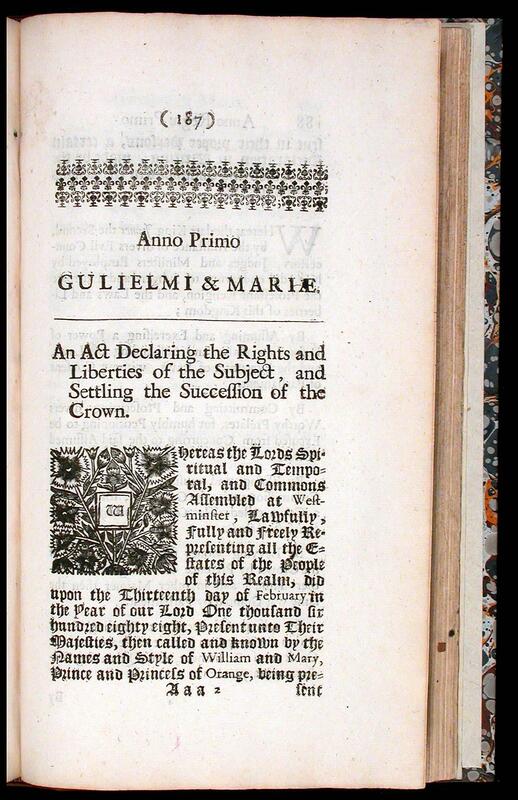 Martin, the Declaration of Rights which our sitter is holding was published in 1689, on the accession to the throne of William and Mary, and which the English parliament introduced as a precondition to their being crowned as King and Queen. 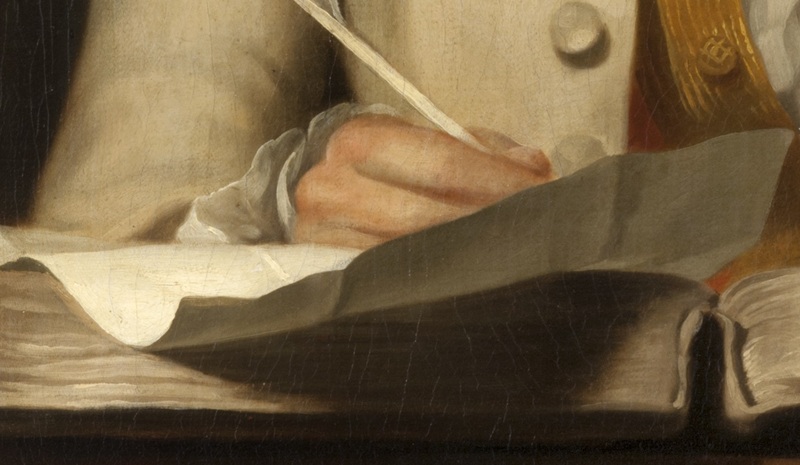 Why, I humbly ask, does this document suggest that the portrait might have been painted in the 1790s? I do believe that the key to identifying this work lies in the relationship between the Declaration of Rights and the Laws of Nevis. Finding a connection between them and any of the families associated to Cragside must surely warrant the most thorough investigation. The binding of the book below the Bill of Rights has lettering on the spine. Can it be deciphered? The career and opinions of the Irish nationalist Wolfe Tone [1763-98] may be relevant. 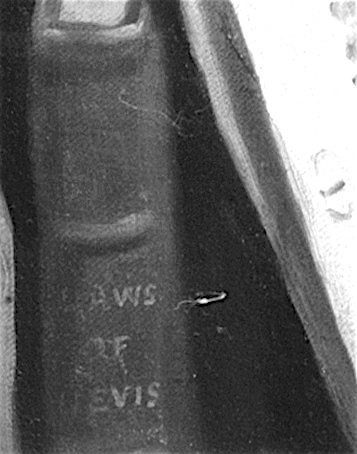 Martin, as was posted above in the comment that launched this discussion, the letters on the spine could read as ‘LAWS OF NEVIS’. 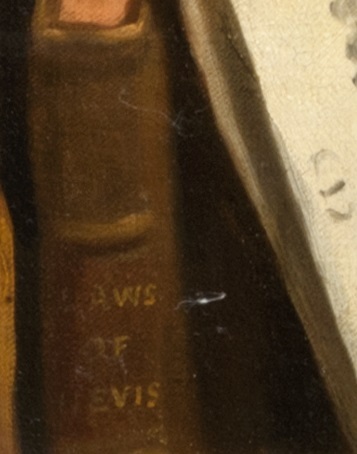 However, in the discussion on a different painting from the Cragside collection it was previously written that the spine read ‘LAWS OF EVID[ENCE]’. It would greatly help if Cragside could send a hi-res shot of this portion of the painting to resolve the matter of which interpretation is correct. The French Revolution , a century after the Bill of Rights, gave rise to a considerable increase of political pamphlets and discussions of all kinds, both from the radicals and conservatives. Art UK may be able to provide a close-up of the relevant area including the book spine from their higher-res version of the image – any chance, Marion? Meanwhile I am attaching the best tweaked close-up I could manage electronically from the public version – to my eye it certainly looks much more like ‘NEVIS’ than ‘EVID’. This would be surprising if it were not for the fact that three of the four families suggested elsewhere as those from which the portraits might have come (Adye, Payne and Willett, who all intermarried – the other is Watson) were wealthy residents of the island of St Kitts – and St Kitts is immediately adjacent to and virtually contiguous with Nevis. Can this *really* be just a coincidence? How the Watsons and Adyes come into the family tree of the Lords Armstrong of Cragside can be seen here: https://bit.ly/2D0O39a . Winifreda Adye (1860-1814), who married the first Lord Armstrong of the second creation, was the eldest daughter of the soldier-artist Gen. Sir John Miller Adye (1819-1900).The Cragside collection includes numerous items relating to both father and daughter, and one of our group of five portraits ( https://bit.ly/2yA4a9S ) is apparently inscribed somewhere with the so far elusive name ‘C. E. Adye’ – we have previously asked for more information about this inscription, and preferably an image in case it might have been misread, but without any response. I would like to repeat that request. The Adye/Payne/Willett relationship was discussed at length in the previous thread, but is so complex and multi-layered that I’m afraid I (and I suspect others) got lost first time round. Patty Macsisak made most of the running then, and came up with a large number of suggestions as to possible sitters in our group of portraits – some of them I now believe are right...but I don’t think this is one of them! In the next few days I will try and put together a tree (mainly based on the one here https://bit.ly/2Sj3MES ) showing how the three St Kitts families relate – without one it’s very hard to get your head round it. But Sir John Miller Adye (above) was in turn the son of Major James Pattison Adye (d.1831), who was the youngest child of Major Stephen Payne Adye (c.1742-1794). The last has been suggested as a candidate for our sitter – although a Gunner (like all the soldier Adyes), he served as deputy judge-advocate-general in N. America, and wrote a highly-regarded ‘Treatise on Courts-Martial’ published in 1769. But for reasons I will go into tomorrow I believe it is actually a portrait of his younger brother, the Crown advocate Abraham Charles Adye (d.1815), later Solicitor-Gen. & Attorney-Gen. of Granada. If I’m right there is a link to the early career of Lord Nelson, which should get Pieter interested again! 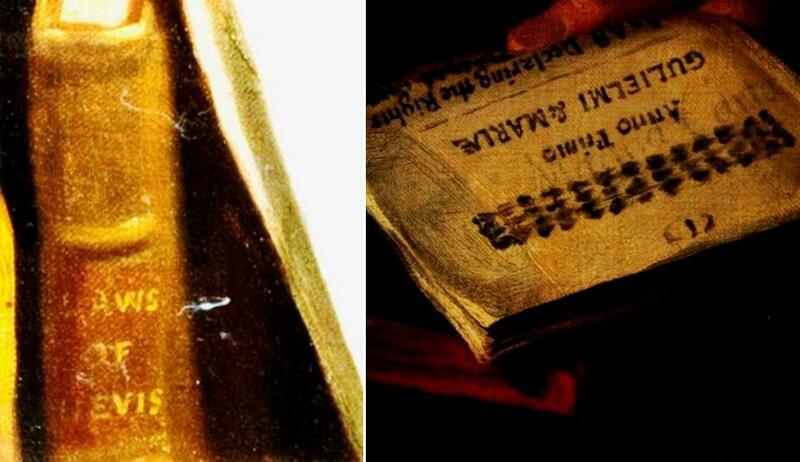 In fact it is possible that the portrait relates directly to the connection ...but that hinges entirely on the book’s title. If it does indeed read ‘Laws of Nevis’, we have the eagle-eyed Alison to thank for the reading, along with Kieran who has identified a probable book bearing the right name. Alison didn’t develop things along the Nevis line, as her focus was on the Watson family; but like Kieran I think that’s the direction that will bear fruit. For the discussion text I decided not to rely on the existing record of this lettering (National Trust and Art UK) but to read the PCF image myself in close-up. 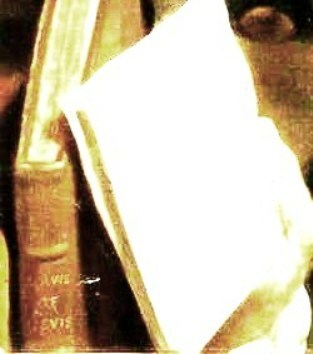 It was immediately clear that the spine of the book did not read 'Evid[ences]': there is a clear 'EVIS', no letter 'D' and no further lettering below. The initial 'N' is indistinct but I inferred it from the twin uprights in the shape and knowing the place Nevis existed (so it was a possible book title, but I didn't know of the book). I added a question mark after it for safety, hoping that others could identify it. I attach the PCF close-ups of the book spine and the pamphlet for others to see what they think. I should be able to attach such close-ups as a matter of routine from now on for some collections and I hope to make this standard practice. Without access to the artworks themselves, it's pretty much essential. Marion, many thanks for posting the close-up images. I attach a tweaked version of consideration. I think that it is very clear that the title of the book in 'Laws of Nevis'. Thank you also for the second attachment. I can now see more clearly the inscribed words Magna Carta. Working out how these three elements - the Declaration of Rights, the Laws of Nevis and Magna Carta - are connected is vital to the unraveling of the painting's identity. That there is a direct Adye/Payne/Willett connection to the Caribbean and St. Kitts, as outlined by Osmond above, must lend further credence to the notion that the island of Nevis is central to this discussion. It should also be noted that in the preface to his 1862 (2nd edition) publication of the compilation and arrangement of the 'Laws of Nevis (1681 - 1861)', its author, Hastings Charles Huggins, states that "There has been no compilation, revision, or systematic arrangement of the Laws of Nevis since the authorised edition of 1774." Should the book featured be a bound copy of the 1774 edition, the painting must date for sometime after that year. Additionally, and returning to my original suggestion that there might be a connection to issues surrounding slavery, it can be seen from the two University College London links below that in 1756 and 1803 members of both the Willett and Adye family were involved in the Nevis slave plantation know as the Morning Star estate. See also the most interesting connection to the theme of the Rights of Man in the biographical entry below to John Willett Stanley (1740 - 1799). See also that of the connected family member John Willett Willett (formerly Adye) (1745 - 1815), both men having been members of the House of Commons. Ooops, my apologies Osmund. My last two links lead to the same book as you referenced in an earlier posting. No problem, Kieran - better twice than not at all. I'm not sure that you did attach the tweaked version of the title, but attached is/are my own one(s) instead. I agree that there is now no serious doubt that the book is 'The Laws of Nevis'. I couldn’t see 'Magna Carta' for ages...until I realized it was the other way up! I think it may be a petimento showing through – the artist or sitter wanted to show some great historical declaration of British rights to go with something representative of contemporary local law, but the decision about which (and its orientation) changed en route. Marion, thank you (not for the first time) for those images. I’m sorry, I seem to have misunderstood who had deciphered the book title – I thought the new reading was part of Alison's intro, not an addition from you. So the congratulations pass, I think, in your direction. Through the link below, it can be seen from the index of the 1740 edition of the 'Laws of Nevis' that a large numbers of Acts deal with issues pertaining to the management of "Negroes, and other slaves", such as, in 1713, 'An Act for the better suppressing the Insolencies (sic) of Negroes, and other Slaves; and the preventing their running away with Boats, Canoes, or Barklogs', or the very many acts, between the years 1700 and 1740, "for raising a Poll Tax on Negroes, and other Slaves, belonging to the Plantations and Inhabitants of this Island of Nevis". Again, could slavery be the core subject in this painting? On reflection, the link to the attached book is to a volume entitled "Acts of Assembly, passed in the Island of Nevis, from 1664 to 1739", but which within is referred to as "The Laws of Nevis". The 1774 edition of the Laws, referred to by Hastings Charles Huggins, was either published by the press of Thomas Howe, government printer at Basseterre on St Christopher's Island (later St' Kitt's), or by his son Thomas, who continued the trade. I'm afraid I think the slavery issue is a red herring, and referring to the "the theme of the Rights of Man" misleading. The truth is that at this time (1770s-80s) in the slave-owning colonies (and to a large extent in Britain), the vast majority of people differentiated in a way we find hard to understand between the rights of white Englishmen and those of black Africans. Moreover to the middle and upper classes this was not really a matter of the rights of the ‘common man’ – it was much more to do with what they saw as their rights against authority and especially the Crown (as Magna Carta had been). Such evidence as there is suggests that the Adyes, their relations and the other planters of St Kitts and Nevis had no problem at all with slavery other than the logistical – and especially, as you show, the tendency of their slaves to rebel, run away and otherwise make a nuisance of themselves. Their main concern was the price of sugar and the profitability of their estates – and their right not to have that profitability interfered with by the British Government or anyone else. Certainly I can find no evidence any of them were abolitionists or in any ways sympathetic to the cause. As the History of Parliament biog you link to relates, a Willett cousin lawyer and later MP John Stanley of Nevis, St Kitts, etc (John Willett Stanley was actually his son) “spoke strongly and at very great length” in 1791 against the abolition of the slave trade; and in 1796 wrote, “What do your Priestleys, your Wilberforces and all these gentry think now of their Rights of Man, and the levelling of all distinctions?”. Osmund, what other theme would you deduce from the obviously intentional inclusion in this portrait of these three elements of the Laws of Nevis, the Magna Carta, and the Declaration of Rights? Although it was an initial thought, I am not exclusively suggesting that they represent an abolitionist's stance, more that they address some aspect of the slavery question. Given your rather chilling description of Willett/Stanley family's attitude, it might well be that the sitter was depicted as someone who wished to defend the slave trade and its beneficial implications for the family or families involved. Have you another suggestion as to how these elements interrelate, or should they be ignored as immaterial to the portrait's intended message? If not slavery, what else is likely or possible? It is no doubt coincidence that Cragside is also the home to John Bell's 'A Daughter of Eve', which was exhibited at the RA in 1853. It's a good question, Kieran, and I fear the answer is equally chilling. For the wealthy sugar planters in the West Indies, and the lawyers who serviced them, their slaves were generally of no more status or significance than their farm animals: they were wholly irrelevant to any concepts of legal or moral rights, and nothing whatever to do with the Bill of Rights let alone Magna Carta. I think our lawyer sitter is just displaying his expertise and pride in the law and its most-celebrated British historical roots. He may have just been called to the bar, or it may possibly relate to specific events in 1785 that I will come to when I have time - be patient! I don't think it would have occurred to him that there was anything strange or contradictory in his dedication to legal process and its (theoretical) defence of the individual, while his profession and his own family denied any participation whatever in that process to those they considered quite simply as sub-human. Yes, the statue is probably coincidence - a product of another age, and Lord Armstrong doubtless supported its anti-(American) slavery message. Would he have known of his forebears' deep involvement in it? I doubt it...but even if he were, I think we were more forgiving 150 years ago of what our ancestors had got up to - "the past is a foreign country; they do things differently there." And yet out of that very distant colony came Alexander Hamilton, who was active in the ending of the international slave trade. And also at the time of, or just before, this painting's likely execution, between 1775 and 1783 came the American Revolution, followed swiftly by the French Revolution from 1789 to 1799. Surely the thoughts that spurred on these events must have effected the likes of our young sitter, even if this work dates from a little later, c. 1805 as suggested above. More specifically to those three associated elements, it would seem strange to me that, whatever about referencing the Magna Carta and the Declaration of Rights, a volume so obscure as the Laws of Nevis would have been used by a young lawyer to, as you say above, display his expertise and pride in the law. He surely could have chosen many other more well-known legal publications to convey that message. Given the evidently close links with the various families associated with Cragside (through the presence of their portraits there) and their well-documented connections to St. Kitt's and Nevis, at a time when they could not possibly have avoided an involvement with slavery (the benefits from which must have flowed back to these families in England), I still believe that the three elements depicted in the painting must hold a key to resolving the identity of its sitter. Well, we’ll just have to agree to differ on that, Kieran, though personally I can't see anything strange (and therefore more deeply significant) in showing a book called the Laws of Nevis in your portrait if Nevis is where you practise law (or are about to). I’ve a lot more research to share on this, but it’s complex and requires further work to put into presentable form. Meanwhile, two more close-up requests for Marion. I’ve just been looking carefully at another of the Cragside portrait group, the one called “C E Adye” ( https://bit.ly/2yA4a9S ), and the subject of previous requests for information from the Collection on the identification / inscription. 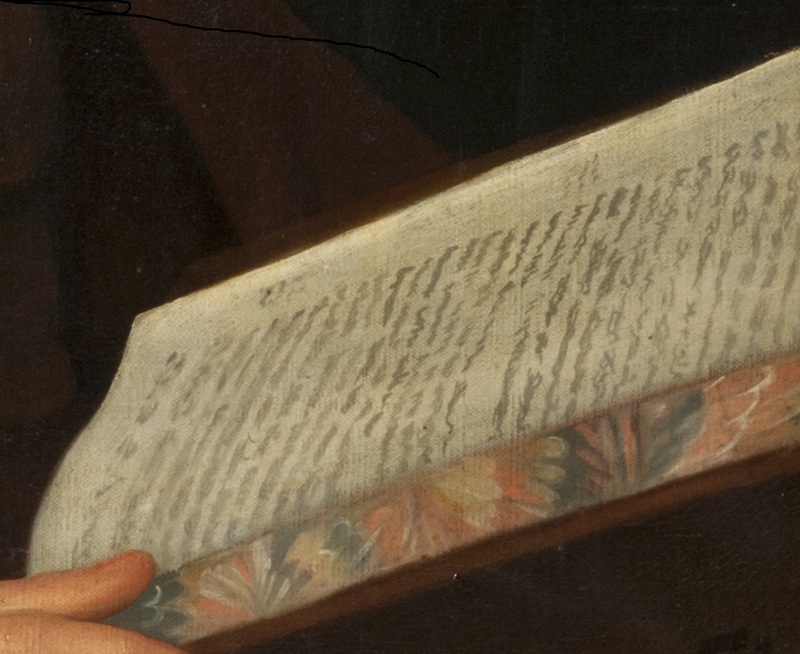 It is a long shot, but after tweaking it a bit I think there may just possibly be something legible on one side or other of the sheet of paper on which the sitter is writing. Could we perhaps see a high-res of that area, please? Similarly (but even less likely), another portrait in the group ( https://bit.ly/2qrkp4O ) shows the youthful sitter reading a large (? )account book or journal – I suspect there is nothing in particular there, but just in case would a high-res of the open page also be possible? And Marion, while you are attending to Osmond's request, please be so kind as to send an image of the "C. E. Adye" inscribed name as is to be found on, I presume, the back of the work. Osmund, please find attached high-res images of C. E. Adye's piece of paper and the book held by an unknown young man, but I'm afraid they don't show anything. Kieran, it will be good to see an image of the name 'C. E. Adye', wherever it is, but that will have to wait until someone at Cragside can follow this up. For now, the agreement is that we can run discussions about National Trust paintings on our website, adding high-resolution images as necessary. They will respond after 3 months to a batch of updates that I am listing on their behalf and and to the discussions that are open. The NT curators have expressed great enthusiasm for Art Detective and want very much to participate, which is why they are trying out sending them batches of enquiries every three months, which I pre-sort into 'easy updates' and more complex queries that give rise to discussion, which might require research on their part. So they are very much engaged with the project but the answers (as far as they can give any) will come quarterly. Marion, that is so interesting and encouraging to hear; thank you for negotiating and organizing it, you are a wonder. And thank you, too, for the rapidly-produced high-res details, even though in this case they are a disappointment. A quick reminder that attachments requested for one painting within a discussion thread about another run the risk of being very hard to find again.